Fruits of Labor: Apples mean big business in Henderson County. And for third-generation orchardists like the Creasmans, they’re a way of life. Even on the weekends, and especially this time of year, the day starts early on Creasman Farms, where fields of fruits and vegetables are in the final throes and some 2,500 apple trees are ripe for the pickin’. As the sun rises over the mountain, Bob Creasman starts up the tractor to finish mowing the orchard before the pickers arrive; Tink, a rambunctious boxer mix that presides over the daily comings and goings, is off for his morning rounds; and Dawn, the gentle matriarch in this third-generation family business, is busy whipping up all manner of apple-baked goodness in the kitchen. The aroma of sweet fruit and cinnamon fills the room as she pulls batches of apple muffins from the oven. Apple butter, apple pies, apple crisp—all will soon be packaged and hauled off, along with bushels of heirloom fruits, to area tailgate markets. Creasman Farms is among some 125 orchards spanning more than 5,000 acres in Henderson County, the cradle of North Carolina’s apple crop. That’s saying a lot, given that North Carolina is ranked seventh in the nation in apple production. Across the state, the fruits are grown in only 23 counties, 16 of which are in Western North Carolina. The warm days, cool nights, and ample rainfall in the mountains are ideal for growing crisp, juicy apples, which last year grossed $39 million for Henderson County. Compared with other area orchards that maintain several hundred acres of trees and sell to large grocery chains, Creasman Farms is a small operation, growing 45 varieties of apples, plus peaches, blueberries, corn, tomatoes, and more on a mere 20 acres. “We try to grow a lot of the old heirloom varieties as well as some of the new stuff that people like,” says Dawn, rattling off peculiar names like Northern Spy, Wolf River, Arkansas Black, and Spitzenberg, among their antique fruits. The approach has been key to staying competitive. “People will stop at the markets and share stories about picking apples at grandma’s house, or they’ll recall the apple stack cake their mother used to make; a certain apple can tie you to a certain memory,” says Dawn. “We sell almost as many memories as we do apples.” And she and Bob, now married for 30 years with three grown daughters, have a storehouse-full of their own. And so it goes. Dawn and Bob aren’t so sure their daughters will continue the family tradition, but only time will tell. It is, after all, in their blood. In the meantime, maintaining the orchard is a year-round affair tackled by Dawn and Bob, who also works full-time at Eaton electric corporation in Arden. They also receive help from seasonal pickers. Winter is the time for pruning, which allows for maximum sunlight, resulting in larger fruit. Spring brings the sweetest-smelling white blossoms, ample rain, and insects. Spraying is sometimes necessary to avoid the loss of crop. Summer days are spent mowing, pruning, and hand thinning. And from August through October, the harvest is in full swing, with each apple being picked by hand and placed in large bins. The apples are then sorted, cleaned, boxed, and shipped to market. 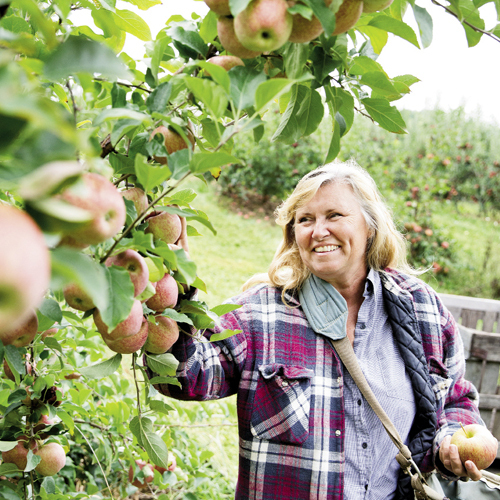 It’s been a good year for the Creasmans if their orchard produces as many as 4,000 bushels. But like all farmers, they’re at the mercy of Mother Nature. “A late spring freeze or summer hailstorm can ruin an entire year’s crop,” says Dawn. Luckily, Bob’s job helps during lean years, and Dawn pulls in extra cash by selling her baked goods, which always go quickly at the markets. And as for the fresh fruits, so long as consumers continue to seek out the locally grown heirloom varieties, the Creasmans and other small orchardists like them will continue to thrive.